If restaurateurs were rock stars (and in Philly, they’re as close as we come), Ben Puchowitz and Shawn Darragh would be vintage R.E.M. Whether they’re slinging ramen with brisket and matzo balls, as at Cheu Noodle Bar, or papering the walls of their new Bing Bing Dim Sum with acid-trip dumpling emojis, they have a knack for twisting a budding trend just far enough to make it unmistakably their own. Cover Story: Is Mitch Williams Getting Screwed? Shoppist: Should Schools Crack Down on Prom Dress Code? Not a Philadelphia Sunday subscriber? Sign up for free! Or maybe they’re Vampire Weekend — tweaking multi-culti source material with a jaunty self-confidence that puts “authenticity” entirely beside the point. 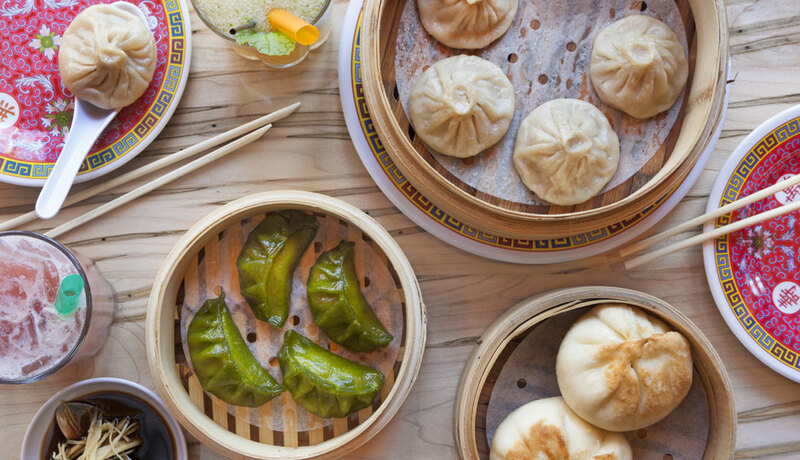 Whatever the case may be, the young Turks of hipster-casual dining in Philly like it loud, buoyant and more than a little off-kilter at their Passyunk Avenue homage to everything dim sum is or might ever be. Bing Bing’s brief menu manages to be every bit as erratic and freewheeling as its Pandora soundtrack. An earnest attempt at soup dumplings — fine, but not as supple or plump as Dim Sum Garden’s cheaper ones — shares space with pan-fried pastrami-and-Swiss bao: frat kegger finger food, though admittedly from a pretty worldly frat. A heady platter of XO-slathered chicken wings, as delectably crispy as the black garlic ones I prefer at Cheu, comes on the heels of a sour cabbage-and-cod soup intriguingly flavored with dill. All these flavors in quick succession can feel a bit like a gang tackle. But then, variety is the soul of dim sum. And the fact that most items ring up for $8 or less helps make up for occasional duds on the menu, like the (short-lived) fried baitfish flavored with nutritional yeast. My favorites adhered to no pattern. Jade dumplings led the pack, steamed so both their delicate spinach-and-cilantro-tinted wrappers and the Gulf shrimp within were exquisitely cooked. Pea leaves carried the deep, woodsy flavor of garlic fermented with lapsang souchong tea and hickory chips. Homemade shrimp powder elevated fried cauliflower florets with a toasty funk. Puchowitz uses matzo meal to make turnip cakes as crispy as McDonald’s hash browns, and tops them with bonito flakes and a fried egg. Now that’s Jewish Christmas! Barman Max Sherman infuses gin with sesame oil to make a savory-and-sweet cocktail that totally lives up to its name, Magic Box, and is a bargain at $9. Some other offerings on his punch-dominated list skewed sweet and watery, but this food cries out for beer anyway. So grab a Sixpoint draft or a $3 High Life—and maybe a second one to make friends with whoever’s bobbing to the beat across the table. Originally published in the May, 2015 issue of Philadelphia magazine.